Protesters outside the Center City, Philadelphia, Starbucks after a manager called police on two black men who were waiting inside. The men were arrested by police. (CNN) - The Philadelphia Police Department on Friday on announced a new policy on handling trespassing calls after the arrests of two African-American men at a Starbucks sparked protests over racial bias. Under the new policy, officers should "attempt to de-escalate and mediate the disturbance" between a property owner and accused trespasser and ask for a police supervisor at the scene "to avoid misuse of police authority by business owners and the appearance of any impropriety by the officers." Additionally, the accused trespasser has to "know and understand that he/she is not allowed" on the property and defy an order to leave in the presence of police, according to the guideline. The owner must also sign a document confirming the intention to prosecute. "While business owners may exclude persons from their establishments, they cannot misuse the authority of police officers in the process," said a memorandum on the new policy. "Such misuse may lead to a technically lawful arrest, but can create the appearance of improprieties on behalf of the officers and the department." An investigation by the internal affairs division found the officers "adhered to state law mandates and did not violate ... policy as it existed then," the department said in a statement. Police Commissioner Richard Ross, who is black, apologized to the men in April, saying he made the decision worse by initially defending his officers' actions. "We've made a lot of progress and will continue to do so as we explore and implement new practices that reflect the importance of diversity, public safety and accountability," Ross said in a statement Friday. 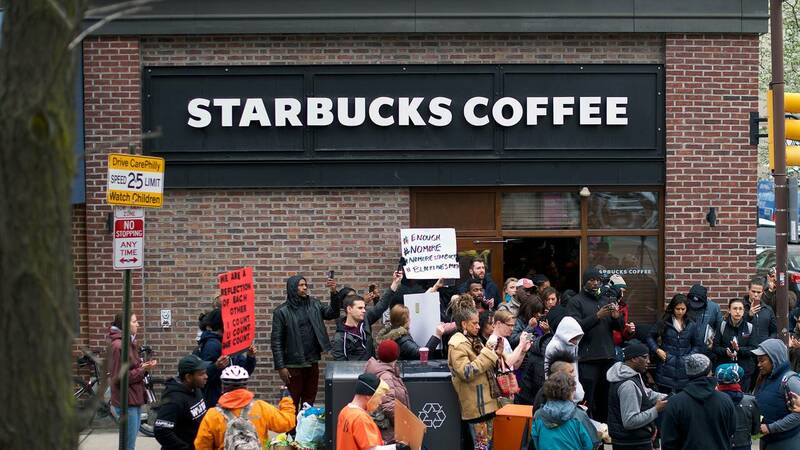 On April 12, Robinson and Nelson asked to use the bathroom at the Starbucks as they waited for a business meeting but were told it was for paying customers only. They then occupied a table without making a purchase -- a common occurrence at the company's locations. Starbucks CEO Kevin Johnson apologized for the arrests, calling them "reprehensible."